The Iconic Narrative Placemaking Project was definitely our biggest project of the year, and had more to do with Physics than with Humanities. 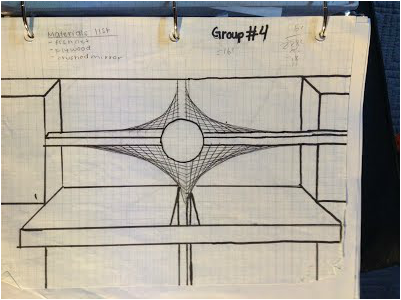 For the Physics side of things, the first step in creating our sculpture was our Blue Sky brainstorm, in which we collaborated as a group about what kind of movement or flow we would want to incorporate in our sculpture. After a lot of feedback and working together, we finally got our final design that we would later turn into reality. 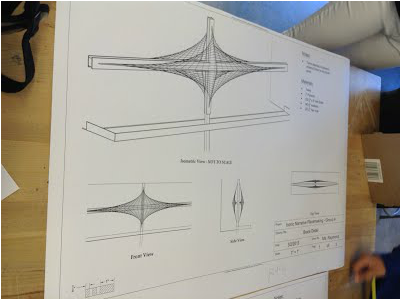 Once we had our final design complete, we had to research what Physics concepts we would have to understand and apply to make our sculpture work the way we wanted to. The four Physics concepts we had to research were fluids of air, velocity of air, momentum, and vectors. Once we had all of the paperwork, so to speak, done, we could start the actual assembly of our sculpture. The first thing we had to do was calculate the exact length, height and width of each piece of our frame. Next, we had to very precisely draw out each frame piece on a block of plywood, and then cut it out using a large variety of tools. Some of the tools that we used included a table saw, hand saw, T-stick, and triangle. Once all the pieces were cut out, he had to calculate the length of each individual string (see design below) using the Pythagorean Theorem. Next, we put the front and back half of the frames together, like you would legos or a puzzle, and then put them together, without connecting the front and back, with a staple gun. Once all the pieces on both sets were put together, we took the frame up to the ledge, and there we put it all together. Obviously many, many, many issues arose during this project, both social and work-wise, but our biggest obstacle came once the frame was assembled. The string we had ordered for our sculpture was too weak, and when we shot the string into place with the staple gun, the staples slit the string in half. We tried doubling over on the string, and tying knots, but nothing seemed to work. On the day before Festival Del Sol, the exhibition in which we would premier our sculpture, we started working with a new type of string. The new string was strong enough and withstood the staples most of the time, but now the issue was that we had less than 12 hours to staple about 500 feet of string. For that entire day of school, I did nothing but staple. It was an excruciatingly long and slow process, but in the end, with almost no time to spare, we finished. I can honestly say that our sculpture was the best, and I am very proud of our final product. I am honestly proud of everything in this sculpture. I saw my group really come together and watched everyone pitch in, and it was unbelievable. The person that I honestly thought was going to work the least ended up being the most committed, and I learned a huge amount from him about tools and how they work. He basically cut out an entire half of the on his own, and he is a big part of why we were able to finish on time. When I saw him working like that, it just reminded me of what this school is all about and everything it stands for. For our Dia Del Los Muertos project, I was project manager, and he was in my group. He did his part, but was definitely not someone you would brag about. for FDS, I was project coordinator, and I was able to see his growth firsthand. That was the highlight of the project for me, and it made me proud to be a Bruin. Aside from that, I am extremely proud of how the string and frame look together, and it really does add life to the hallway. I honestly would not change a single aspect of this project because without the struggles, the sculpture would not be what it is. In addition, I believe I learned a lot more from our mistakes than from our successes during the course of the building, assembling, planning and designing. Although our product is nowhere near perfect, and really nothing about this project was perfect, I do feel like the process was perfect because of how much I learned. I honestly used every single Habit of the Heart and Mind every day. Obviously, I used Cooperation just about every second because it was a massive group project. I had to use Compassion when our group faced a very serious and distracting social issue, and I had to help get our group back on track and focused while still being sensitive. I used Mindfulness when we were doing the Blue Sky Brainstorming and designing, and had to be kind, insightful and polite when giving critique. I used Perseverance basically every day and hour, building, designing, stapling, you name it. We honestly thought we were not going to finish. I used Refinement when we were fixing our design, or when fixing something that didn't go as planned during the building process. I used Perspective when helping to solve issues within our group. Finally, I used Evidence when solving for the length of each string, because I had to make sure our calculations were exact.